10:01AM EST December 10. 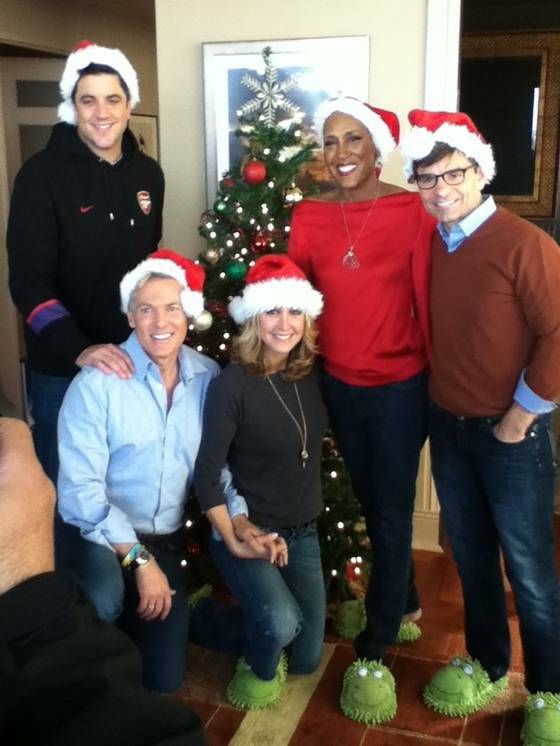 2012 - Robin Roberts, who is continuing to recover from her Sept. 20 bone marrow transplant for her rare blood disorder, welcomed some of the Good Morning America gang to her home to trim her Christmas tree and sip spiked punch. "Best medicine ever," she tweeted, meaning the visit, not the punch. Josh Elliott, Sam Champion, Lara Spencer and George Stephanopoulos put on Santa hats and opened presents when they stopped by after Thursday's broadcast. Josh and Sam went for the spiked punch, noted Roberts on Twitter. In footage of the fun that aired this morning on GMA, Roberts, 52, said she is looking forward to her next step — "returning to work." The anchor even said she will welcome the "normalcy" of the alarm going off at 3:45 a.m. No date or time frame for her return was given, though. On Dec. 1, she was allowed to leave her NYC apartment to travel to Connecticut. And she tweeted last week that her beloved dog, K.J., will be home "soon." All good signs. Early Christmas Presents- What Fun! Dom Remains in COMPLETE REMISSION! More GMO Tidbits.... Knowledge is Power!